When your scissors get sticky or grimy wipe them with down with a cloth dipped in full strength DYC white vinegar and dry them with a cloth. The vinegar will help break down any grime and act as a natural germ inhibitor. Washing scissors with water is more likely to make them rust. 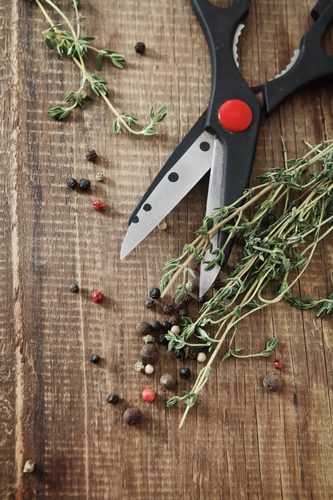 If your scissors already have rust, simply allow them to soak in full strength vinegar for a few days. When your scissors get sticky or grimy wipe them with down with a cloth dipped in full strength DYC white vinegar and dry them with a cloth. If you have rusty scissors try soaking them in full strength vinegar for a few days and scrub them with a non stick scouring pad. Wipe with a cloth dipped in vinegar to remove any residual rust and dry with a clean cloth.